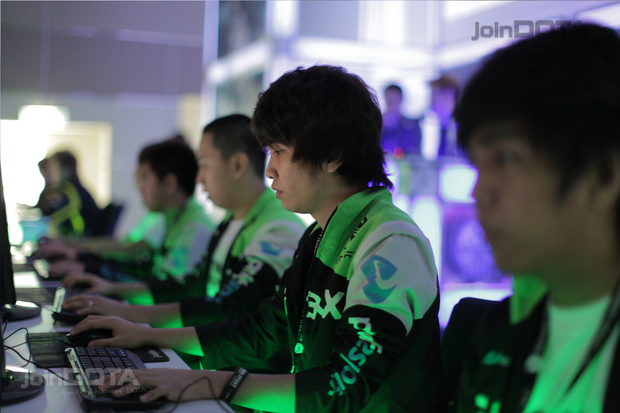 Pacific.Emax has defeated iZone.Gigabyte to be the champions of SMM 2012! Pacific.Emaxx DotA wins SMM 2012! Pacific had a 1 game advantage going into the grand final best of three series, and iZone knew they had to pull something amazing to get the game back in their favor. They decided to go with Bristleback, an unconventional hero pick to say the least. The early game had some exciting action, with both teams exchanging a few kills. However, an overextention from Bristleback severely hurt iZone. Sensing their advantage, Pacific played aggressively to shut down the Shadowfiend. This proved to be a turning point in the game, as Bristleback managed to survive an entire teamfight and get an ultra kill. The momentum of the game began to shift towards iZone's favor with a tanky Bristleback and Joven's high damamge Shadow Fiend. But overconfidence cost iZone four heroes in exchange of just two from Pacific during an engagement near the Scourge jungle. Pacific nearly threw the game away when Dragon Knight was stunned by Roshan as he tried to TP back to defend. However, four time GEST champions Pacific.Emaxx played calm and were able to use Dragon Knight's late arrival to kill off all of iZone's heroes. The game was too close to call, as both teams had engages that were favorable. But the final 5v5 teamfight saw Pacific.Emaxx taking out all of iZone, and iZone calls GG. Pacific.Emaxx wins the entire tournament without a single defeat, proving to the best DotA team in SMM. Congratulations to Pacific.Emaxx for winning SMM 2012! Click here to view the complete bracket.